This is the second post in the series on "What's Up With The Rectangle?" I started this post series because I was asked about it in the Facebook Group. One blog post is not enough - this blog post won't make sense without the other one, so go read ﻿﻿that one and then come back. The rectangle covers a lot of math concepts that are introduced in elementary and high school mathematics. 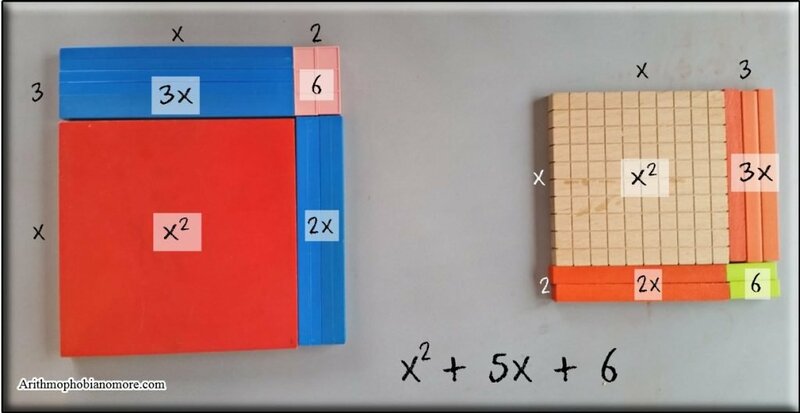 This post we are going to talk about how it helps us with polynomials and how using the rectangle with polynomials will help us understand what's going on behind rapid mental calculation tricks. Last time I posted about the rectangle, we talked about it being a grid. Base ten blocks are a physical representation of the same grid and provide for a depth of understanding that the grid alone does not offer. We want students to understand and know the math before giving them algorithms. You'll notice that in the image, each section represents a row and column in a grid. We multiply each row and column together and then we add them at the end. This is the distributive rule in action. Some people will call this expanding the brackets, or expanding the parenthesis. All we mean is that everything gets multiplied by everything else. Remember from the last post, we add on the diagonal. We have x2 + 5x + 6. The reason we are doing this is to keep the x2, x's and units together. This helps us understand what is going on. Now let's try the rectangle with negative polynomials without setting up the rods. We can easily do this in a grid without a problem. Nothing changes. We use the distributive law and multiply everything by everything else. Nothing magic happens because we've suddenly switched to negative polynomials. If we add on the diagonal we get x2 - 6x + 8. ​Now let's take this whole idea and multiply something as simple as 6 x 8. Most of us know this fact, but let's say we didn't. How could we use the grid and negative polynomials to multiply 6 x 8. This will become important as we extend this to larger numbers, so please play along. This is that rapid mental calculation I talked about in the first post. If you play the ﻿﻿﻿﻿﻿substitution ﻿﻿﻿﻿﻿game you know that we can rename six as 10 - 4. We can also rename eight as 10 - 2. Why would we want to do this? It is always easier to multiply numbers that are near a multiple of 10 and 100 and 1000 and so on. Now that we have a nice clean number like 100, we subtract 40 from 100 and then another 20 and add 8 to get 48. What happened? We have x2 - 6x + 8, just as we did above. That seems like a lot of work. Can we shorten this process now that we know what we are doing? We can. It's pretty simple really. Note that we didn't start out at 10 and subtract the 4 like we did above. We are attempting to shorten this process for rapid mental calculation. Notice in the grid, that we started at 100 and subtracted 60. We are going to start at either 60 or 80 and subtract 20 or 40. It is up to you how you want to do it. We do this by cross subtraction. It doesn't matter how you do it, you are going to end up with a 4 in the tens column. If you start at 8 (which is really 80 because it is in the tens column) you've already subtracted 20, now you just need to subtract 40 more. If you start with 60 you just need to subtract 20. This is adding the diagonal section above. All that is left is to multiply the ones column together. Remember how our grid was set up? We multiply each row by each column and then add at the end. 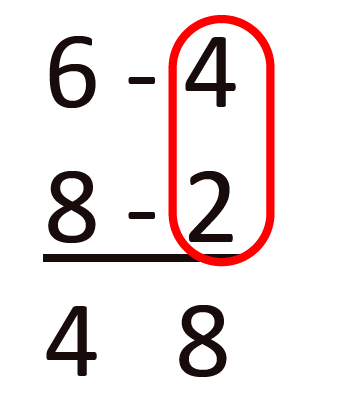 The last column is -4 ( - 2) = 8. You have your answer. This looks like a long process on paper. But if you know how to do it and why, with some practice, you can do this mentally with little effort. Older students, who are using the rods, should also get a lot of practice in using this method. 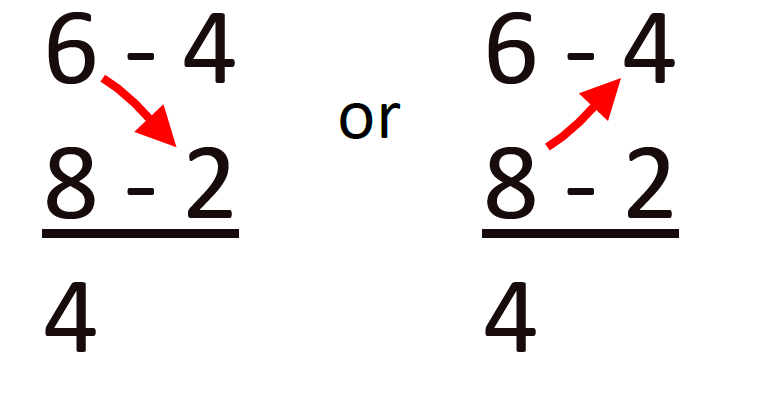 Once it becomes automatic, you can try your hand at larger numbers. Which we'll get to next time.